Well, it finally feels like spring. A number of our teams have braved wind, rain, and even hail while playing lacrosse. Kudos to all our tough Coyotes! All of our teams are off and running playing games even our youngest players on 8u! I think the new age groups and rules that apply are proving to be an exciting direction for the sport of lacrosse. If you would like to learn more about the new player development model, please click here watch this video. Wonderful to see 12 Coyotes alums playing for 2 strong local high school teams recently and 2 more on hand to cheer on their old teammates. Please support your team managers by responding to their emails/requests for assistance at home games. As a volunteer organization, we require help by all members to make things run smoothly and allow the coaches do what they do best, coach our kids. Make sure your Coyotes show up to games early with plenty of time to get their gear on and warm up! Games start promptly and early preparation shows respect for your coach and your teammates! Please be mindful of Burlingame High School stadium rules. We have already been informed of some “rule breaking” and don’t want to lose our reserved field time. Please do not enter the stadium until your permit time. No loitering on the track, even during our allotted time. The track needs to stay clear for members of the community. This includes bouncing balls on the track. Fans/parents are required to sit on in the stands or if they want to sit on the field it needs to be in the end zones behind the goals. No dogs allowed on BHS campus (including the track area and the gated area outside of the track). No food inside track area. Only water can be brought into the field area (no gum, Gatorade, etc ). Any team snacks need to occur outside of the gated track area. Notices and registration for summer LAX camps are out! If you would like to work on your skills in the off season, summer camp is a great way to continue improving and learning! 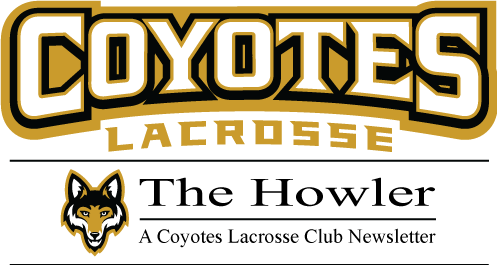 Check out CoyotesLacrosse.org for camp info!